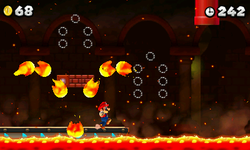 World 2 is the second normal world appearing in New Super Mario Bros. 2. 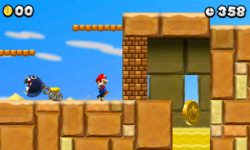 This world has a desert theme and introduces the new Gold Flower power-up, which transforms Mario into Gold Mario (and Luigi to Silver Luigi). This world has four Toad Houses, two are red, one is green and the last is a Star Toad House. 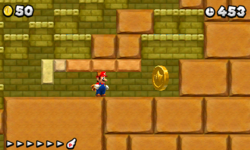 It is also the first world with a Ghost House in the game. 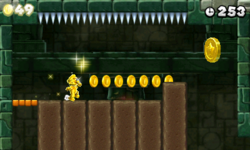 This world consists of 11 levels. 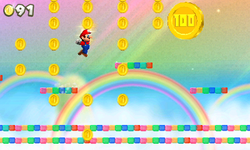 eight of them are on the main path, two levels are optional and the last is the world's rainbow level. 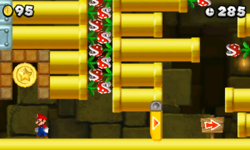 This world is also optional as it can be bypassed by completing World Mushroom. 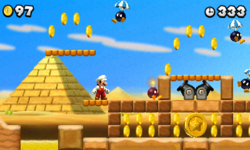 The map music and overworld music of the world is the same as that of World 2 of New Super Mario Bros. Wii. 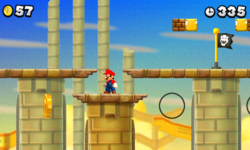 The world layout is also similar to World 2 of New Super Mario Bros.. 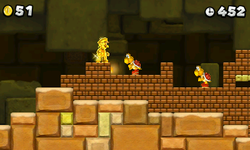 The boss of this world is Iggy Koopa. This page was last edited on April 6, 2019, at 01:12.